Since it was launched as a national competition in 2006, Poetry Aloud has grown into a national phenomenon, involving students in second-level schools around the whole island of Ireland. Students stand up in front of judges and audiences and speak poems which they have learned by heart, their performances judged on clarity and their ability to communicate emotion and meaning. 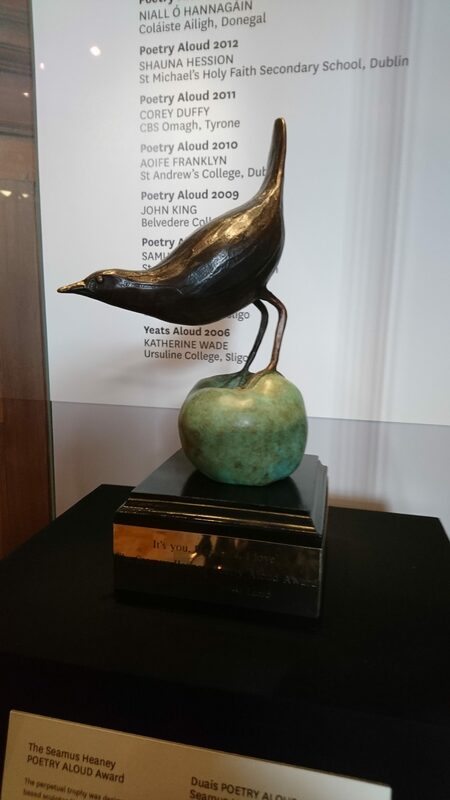 Poetry Aloud follows the 2018 competition, from the regional heats in October, through the semi-finals in November, to the final in the National Library of Ireland in December, where the overall winner is presented with the Seamus Heaney Poetry Aloud Award. We meet some of the talented students taking part, enthusiastic teachers, and the two powerhouses behind the competition: Moira Cardiff of Poetry Ireland and Bríd O’Sullivan of the National Library of Ireland. We also meet Niall MacMonagle, the man who started it all by setting up a small competition at Wesley College, where he was an English teacher, some 25 years ago. He is delighted at how the competition has become a national competition, which in 2018 attracted over 1700 entries. Throughout the programme we also hear readings by students of poetry by both Irish and international poets in the 2018 competition. Poetry Aloud is a Rockfinch Production for RTÉ lyric fm, funded by the Broadcasting Authority of Ireland from the Television Licence Fee. Presented and produced by Claire Cunningham. Sound supervision by Tinpot Productions.